I just want to start out by saying I feel lost in the blogosphere without Wax Heaven being updated. I hope someone decides to step up and try to fill Mario’s unusually large shoes. I know it won’t be me because I have a hard time posting once a week. But I truly hope someone decides to try to create something close to what Wax Heaven was. On another note, I just got the cards back from Beckett on Saturday. One person came so close I would almost feel bad not giving him the prize. I wanted to give everybody who hasn’t taken a guess the opportunity to get their guess in. Details of the contest can be found here. I leave it open until Wednesday. On Wednesday I’ll post a complete write-up on my experience on getting cards graded and pick a winner. It’s not all bad and not all good either. I generally don’t like writing posts without some sort of eye candy. 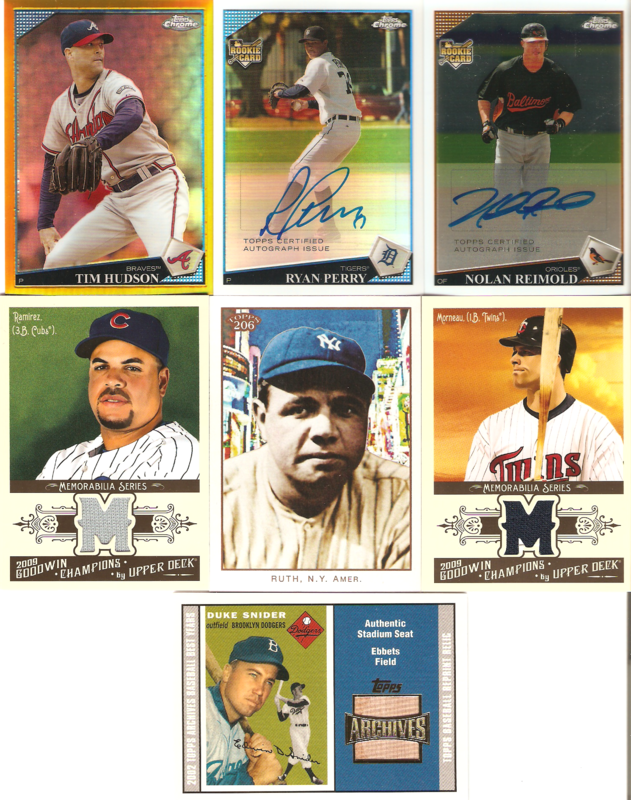 So here is a scan of what I picked up at the local card show last weekend. The Chrome came out of a box I picked up on the cheap and is up for trade. So is the rest for that matter. Enjoy. What would you like for the Tim Hudson? ?